This is a postcard I found on Sunday in a local antiques fair. 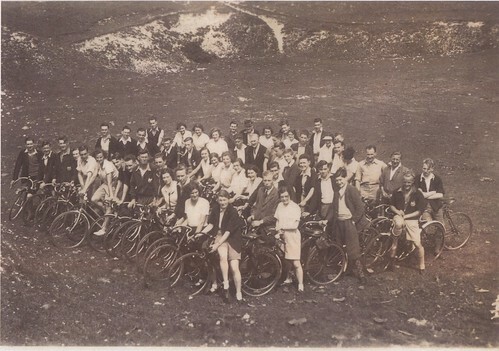 It depicts Ventnor Cycle Racing Club and is believed to have been taken in 1936. The cyclists have been carefully arranged to be in a formation that depicts the shape of the Isle of Wight! Ventnor is a small seaside town on a very steep hillside. The picture shows more than fifty cyclists, quite a lot for a small town club and more than the current membership of my own club, the Wayfarer Cycle Touring Club, which encompasses the whole island. I know nothing else about this club but finding out about it may well be my winter project! 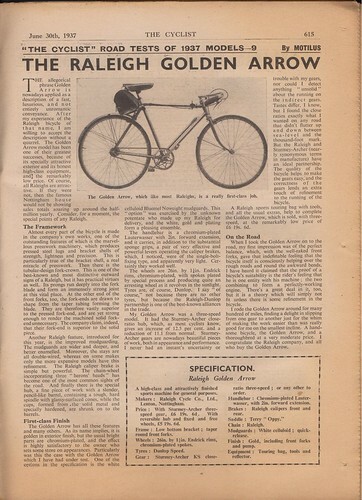 It set me wondering about the world of the keen cyclist of the 1930s and I hope to shed a little light on it with the help of an old magazine. I've no magazines for 1936 but this one from June 30th 1937 seems close enough. This was a weekly magazine published every Wednesday. 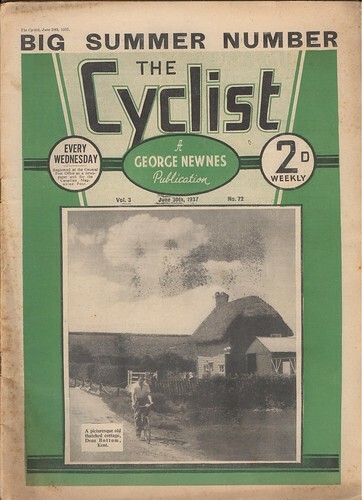 This is a bumper issue but even so it was a substantial magazine to be published weekly especially as there was also a rival weekly, the long established 'Cycling'. 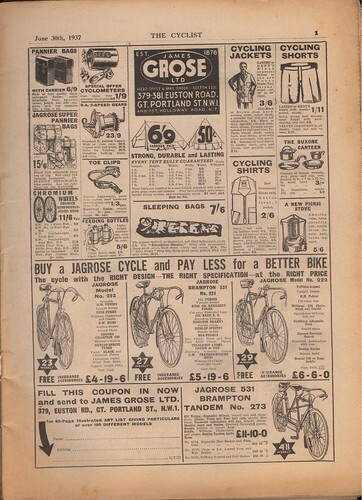 Could todays cycling boom sustain two weekly magazines? 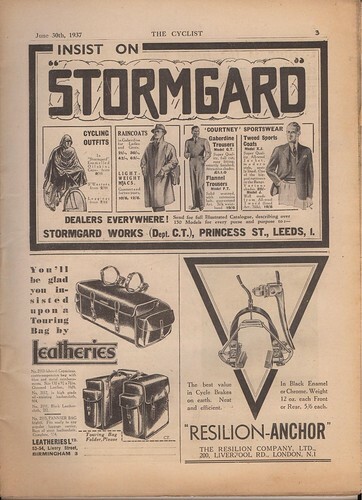 There was certainly no shortage of equipment available as the following advertisement pages demonstrate. The cyclometer is little different to the one I had on my bike in the mid 70s and the 'Buxone Canteen' is also exactly like the one that I was thrilled to own when I was about eleven. Exactly the same design with the frying pan handle attached with a wingnut. I wonder if it was made with the same paper thin aluminium that burnt your food the moment it got near a flame! Probably not. I certainly never had anything like those natty jackets though! Despite wearing what to me looks like formal dress and carrying heavy oilskin waterproofs they certainly got about. An article describes a tour following the river Elbe in Germany. I'm not sure if the Yorkshire ride described was intended as a day ride or a weekend tour but its a cracking ride and very hilly. Is that hand drawn map in any way inferior to the GPS computer versions that we produce? They were an innovative lot too. And finally no magazine would be complete without a test report on the latest bikes. Somehow I feel close to these bygone cyclists. In many ways the modern world bears little resemblance to the world they knew but the essence of cycling remains the same. We still strain up hills and delight in swooping down again. The first rays of the sun on a frosty morning feel just as wonderful as ever. Many things have changed over the last seventy years but the pleasure of cycling is just the same now as it was then. Posted by Hilary on October 27th, 2010. I love reading through old magazines like the one you've shared here. Good find. 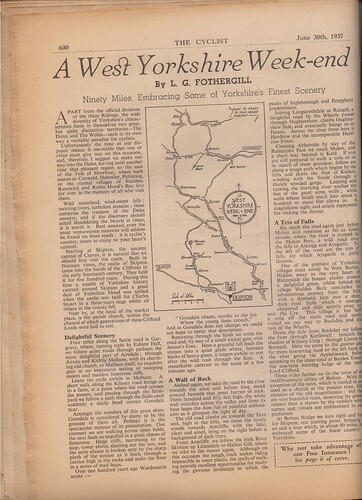 It's interesting that the article "A West Yorkshire Week-end" mentions the Ridings – or 'Thirdings' – and the Dales and Wolds. I wonder whether the Moors didn't have sufficient roads to cycle in those days. Anyway, it puts the Dales (including some of the places Patrick and I passed through a few weeks ago) in 'West Yorkshire', but these are part of modern-day North Yorkshire these days. I've had a quick look on the Internet to see if the Dales were under the control of some west Yorkshire authority back in the thirties, but I've not found anything yet. Perhaps it's just a mistake by some sub-editor many miles away on the Isle of Wight. Don't know. Nice read, though – thank you. If it wasn't for the World Wide Web I think there would actually be more than two weeklies but we wouldn't be sharing things the way we do now. Good post Hilary. I don't remember the Buxone Canteen but we used to wear oilskin cycle capes and Souwesters in the 50s and 60s, even in the Scouts as a cape went over a rucksack as well. The Resilion Anchor in the advert is a cantilever brake. They were a British invention according to Classic Lightweights UK, 'awarded the CTC plaque that year for the greatest advance in cycle design' (1929). It seems that West Yorkshire Week-end is a loose characterisation: 'in the west' of Yorkshire. I agree it's very interesting, and a great photo. A good find indeed. The hand-drawn map is charming and small enough to put over the handlebars, but being a GPS-person I'd have to say something at least! Navigation by GPS is not really using a map, or at least not with mine. I've used it with no map at all. It just tells you which way to go from the point you're at, or shows you a wiggly line to follow. But enough of that. I'd like to cycle that route some time, and it starts at Skipton where Chris and I met up. Do-able on a nice summer's day (hint hint) but I'd say it was intended as a weekend tour as the author describes sightseeing on foot, including Goredale Scar. I actually still have two rain-capes. When there's no wind, the rain-cape is the best rain gear, but that's a very small "when" in Cork. It's usually a bit too windy here when it rains. You never see someone with one now. 25 years ago most of the foreign cycle-tourists here used them. 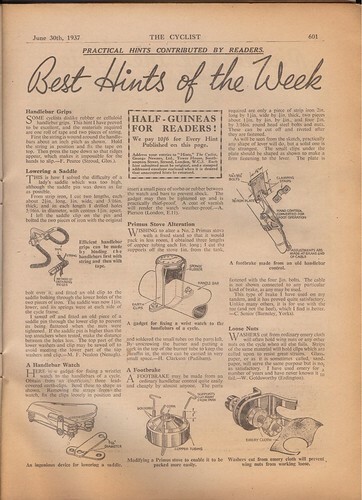 I find these old magazines fascinating, glad to hear you like them too. You guys must have good eyesight to pick out the detail in the Yorkshire article. It must be about 25 years since I last cycled that way, I remember it as great cycling country. Never had an oilskin cape but I did have a lightweight 'Pakit' one. As Garry says it was great when there was no wind with the rain but that didn't happen often. It was also great for brew stops – like having a small tent! It lived in its stuffsac in my saddlebag but eventually cracked along the folds. It's easy to read when you click through to the original image size in Flickr. That's one of the great things about Flickr, provided the original is big enough. I've begun plotting the West Yorkshire tour as a GPS route for our GPS cycle routes page.